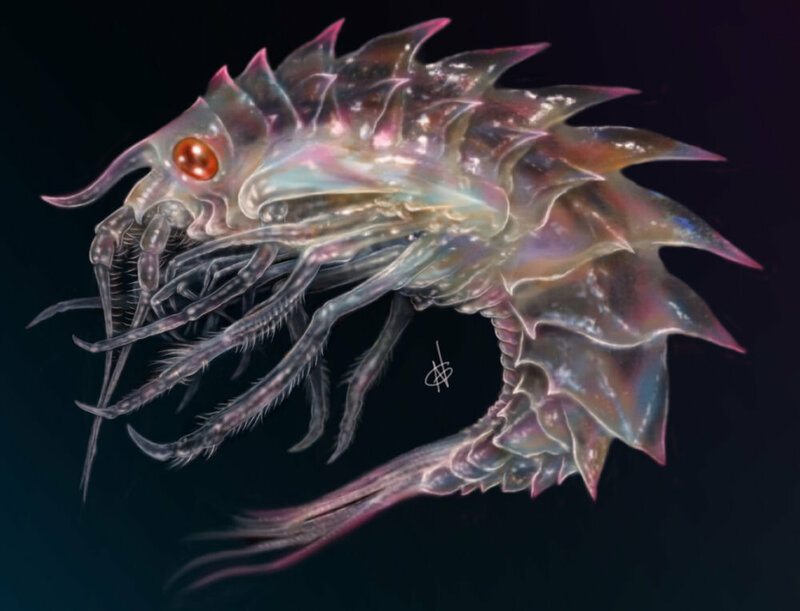 The oceans of Europa will be filled with flora and fauna of varied types and levels of hostility. While some creatures will pose a deadly threat, others will be only a mild annoyance or risk to the integrity of the sub. With this in mind, we will strive to create a wide array of critters, all with gameplay and functionality at the core of the design. A study on translucence, inspired by a multitude of small to microscopic creatures/parasites within our own oceans. With early designs, there has been an effort to create familiar creatures, but with an alien take on the form. As the reference paintings progress, the stranger, less familiar and recognisable creatures will proliferate this page, but for now, while we experiment with form, theme, and consistency for each species, we will work on critters less critical to the narrative. A crab-like critter, inspired by all the things that are so creepy they're cute. Just me? Everything, but the kitchen sink. While experimenting and exploring possibilities, all manner of weird and wacky sketches have been created. With the modular nature of creation, all or merely some parts of early concept art will make into final creature design. *Seriously, after researching for Europa Descent, I'm never swimming in the ocean again. Early exploration of more deadly, alien, sea beasts, inspired by Lovecraft and the incredibly scary things that live deep in our oceans. Latest sea creature inspired by prehistoric fossils.